A twisted steel screen wall, painted in bright colors, brings an artistic spark to the sidewalks of the Gateway District in East Portland. 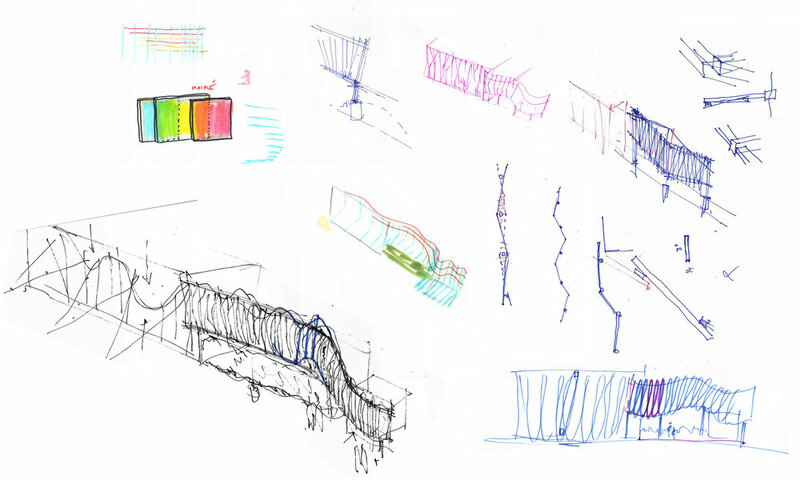 Continuing our work in the Gateway District, this project proposes a public art installation that creates a colorful screen wall that masks a parking lot. The project aims to be a backdrop to community events, farmers markets, and other activities, drawing attention to two new businesses in the district. The screen is made of a steel tube structure that supports plate steel louvers painted in bright colors. The structures bend a fold along the length of the installation, and the louvers weave between the structure to create a dynamic form that is playful, yet simple to construct. Each of the louvers is the same size and can be easily and affordably fabricated. The screen wall morphs into a mural on the existing blank wall of the adjacent building. We are collaborating with a local artist on the design of the mural graphics.